If you're vegetarian or vegan, meeting protein needs can be tough. This protein-packed tofu recipe provides the protein your muscles need and the taste your palate deserves! For vegetarians or vegans on the quest for more muscle, getting enough protein every day can be a challenging task. You can down only so many pea or brown rice protein shakes before the blender blahs set in. That's why I came up with this high-protein tofu dinner recipe! It's delicious, healthy, vegan-friendly and will help you build muscle. All in all, it's a recipe full of win. Pair this recipe with your favorite carb source. 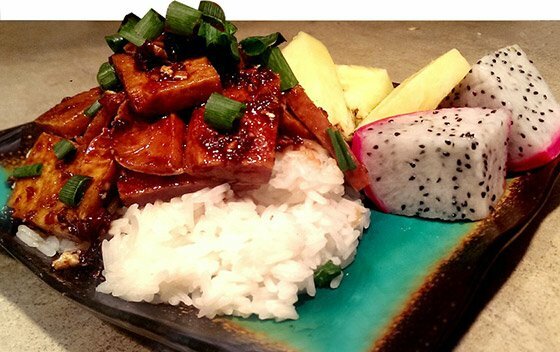 I poured the tofu over jasmine rice and garnished it with some green onions, dragon fruit, and pineapple. Yum. After you make this, let me know how it turned out in the comments section below.